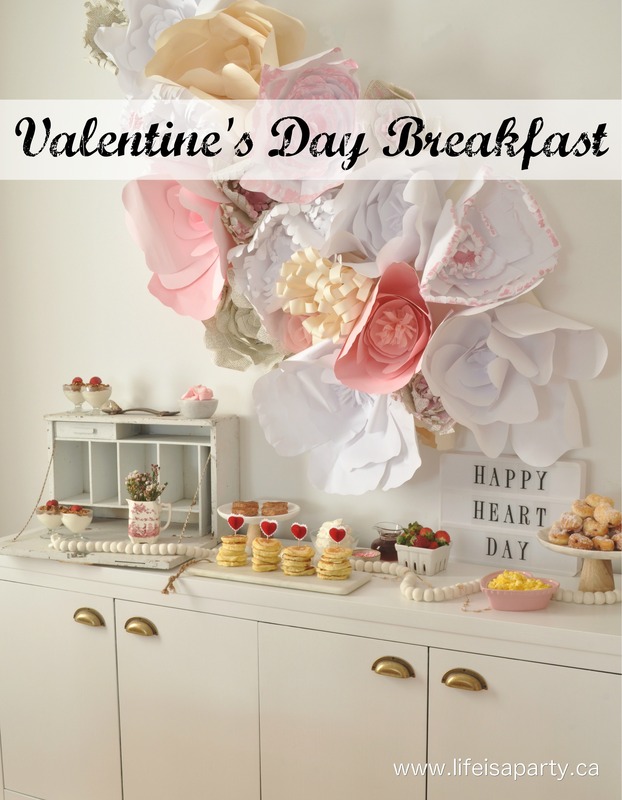 Valentine’s Day Breakfast: decor and menu ideas for celebrating Valentine’s Day with family and friends with a special breakfast buffet. I love Valentine’s Day, and as much as I love celebrating with my sweetie, I also love celebrating as a family. 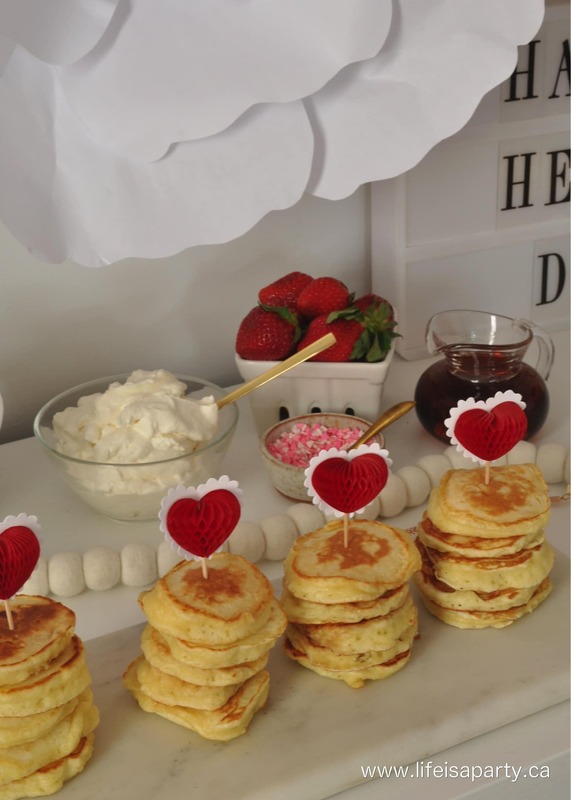 This Valentine’s Day Breakfast is the perfect way to celebrate together -and share a little love with a special Valentine’s Day Family Breakfast Party. I started out with the beautiful buffet. 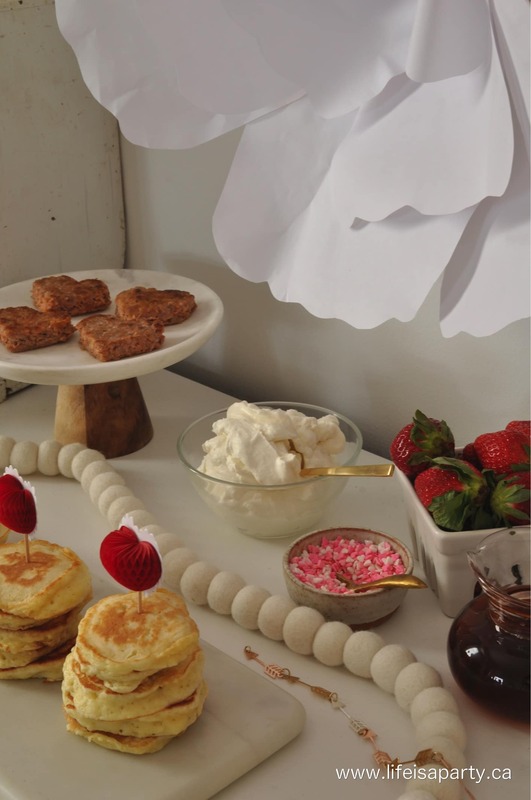 When I decided to make a special Valentine’s Day Breakfast, I thought it would be fun to set it up as a buffet with lots of fun choices for everyone. 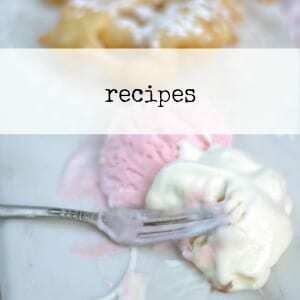 Around our house, buttermilk pancakes are a real favourite. So for Valentine’s Day I made little silver dollar pancakes, and served them in little stacks. The pretty heart pix were the perfect final touch. We love to top our pancakes with real maple syrup -we are Canadian after all. We also had some whipped cream, strawberries, and the sweetest little heart sprinkles. Along with the wonderful pancakes, we had to have some sausages. To make them a little more festive, I cooked sausage patties, and then made them heart shaped with a cookie cutter. 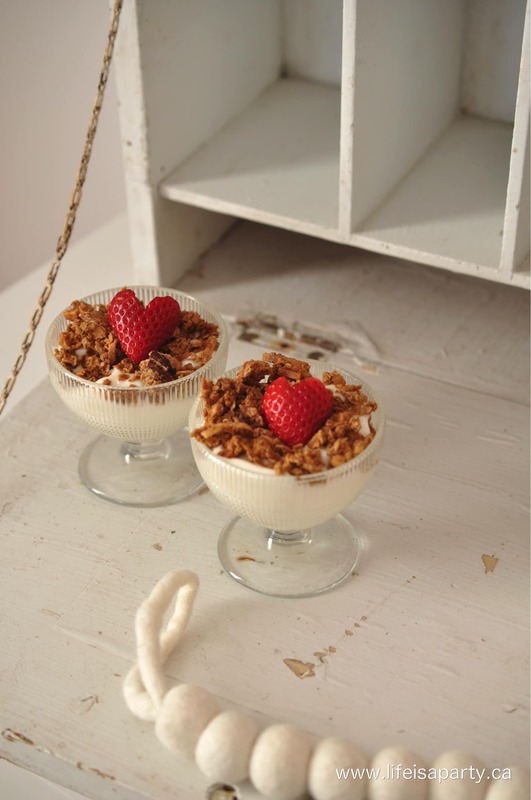 I also made some breakfast parfaits. 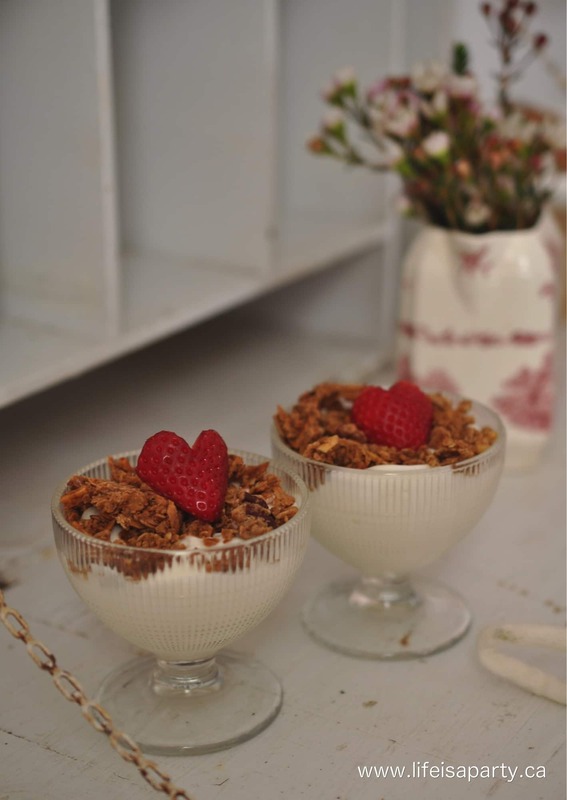 These are made with some vanilla yogurt and my favourite homemade granola -get the recipe here. They got dressed up for Valentine’s Day with some strawberry hearts on top. I also made some really simple scrambled eggs. 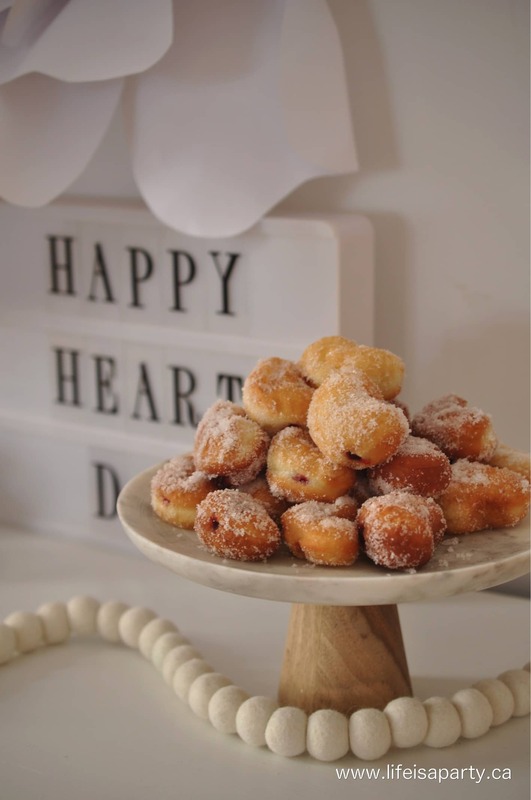 And probably our very favourite of the morning, we had homemade jelly donuts -get the recipe here. 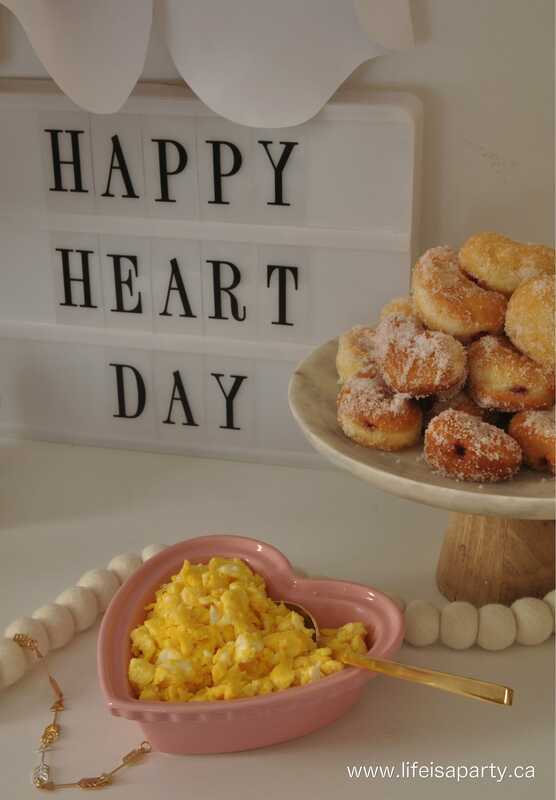 These heart shaped donuts are pretty easy to make because the dough for them is made in the bread machine! So good. 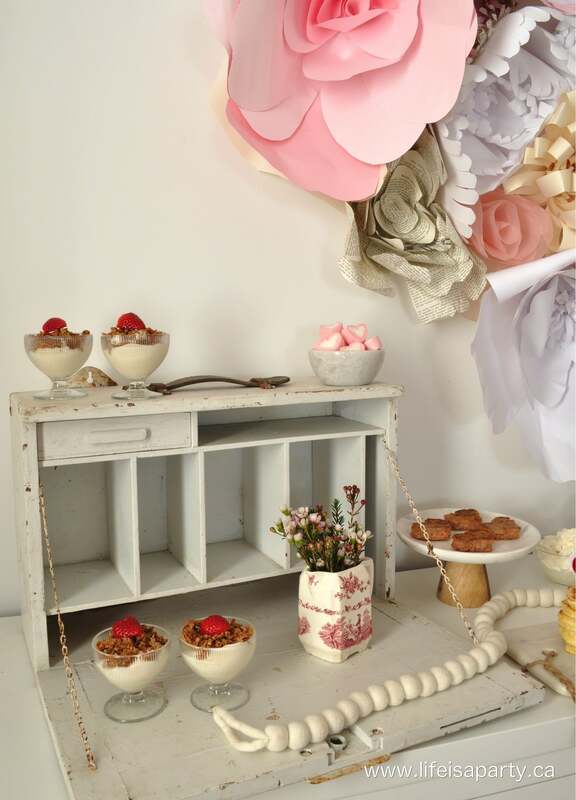 My very favourite element of the Valentine’s Day Breakfast Buffet though, has to be the amazing paper flower backdrop. I actually made the flowers quite a while ago and had them stored in a plastic bag in the basement, since they’re so pretty I couldn’t bear to throw them out. 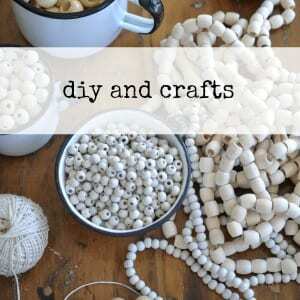 They’re quite easy to make -you can see my how-to video by clicking here. I used pinks, white, some off-white, and some book page papers. Some have a little pink paint added here and there too. To hang them over the buffet, I hot glued them all to some paper in a kind of swag, and then used command hooks to secure the paper to the wall. 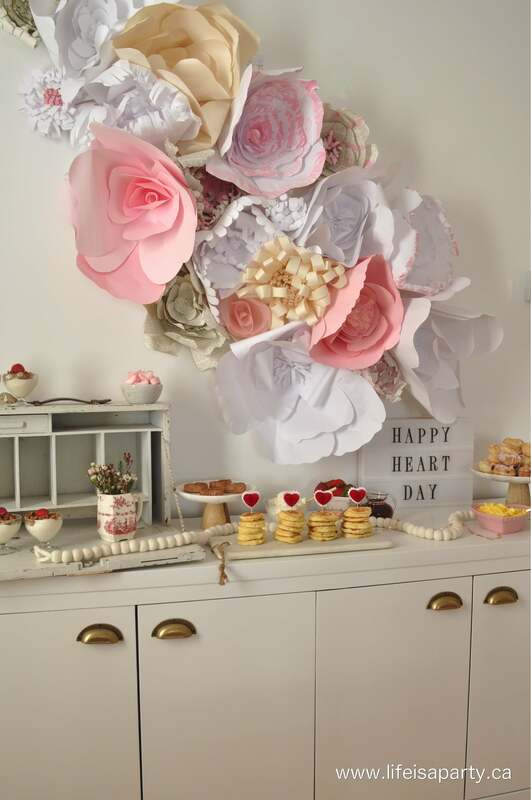 The giant paper flowers are so pretty, I don’t think I want to take them down! 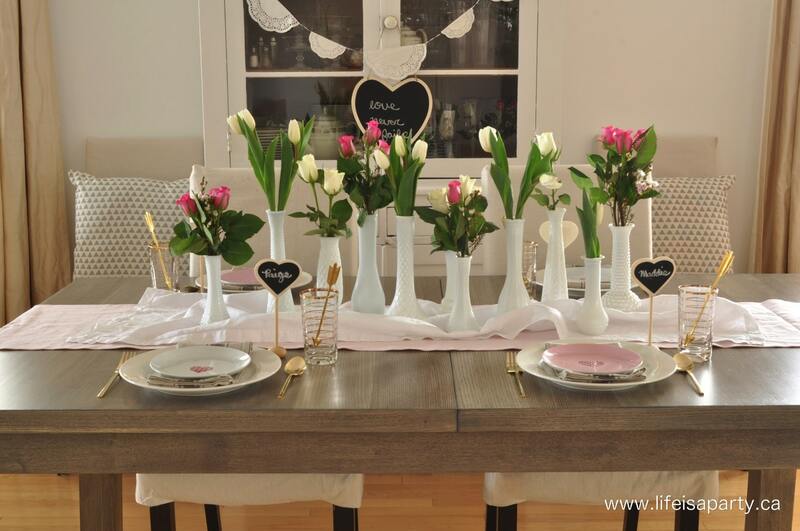 For the Valentine’s Day Dining Table, I kept it pretty simple. I layered a few runners I already had, and added some beautiful flowers. 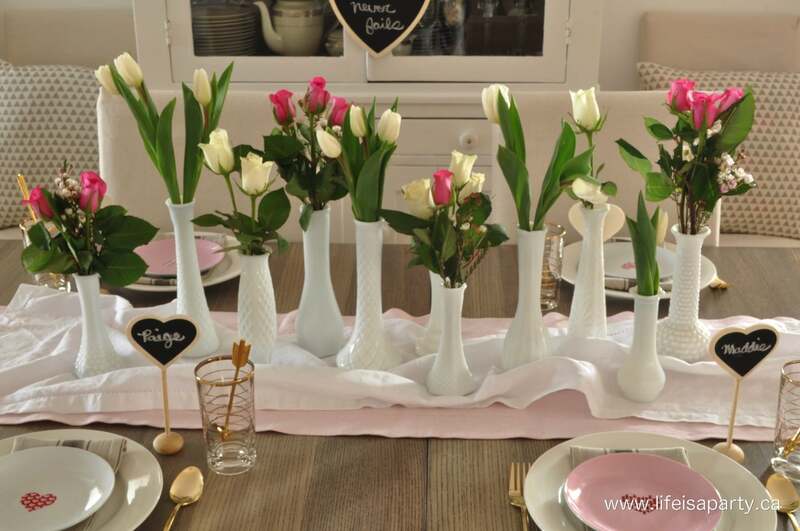 I used an assortment of thrifted milk glass bud vases, and added some roses and tulips. 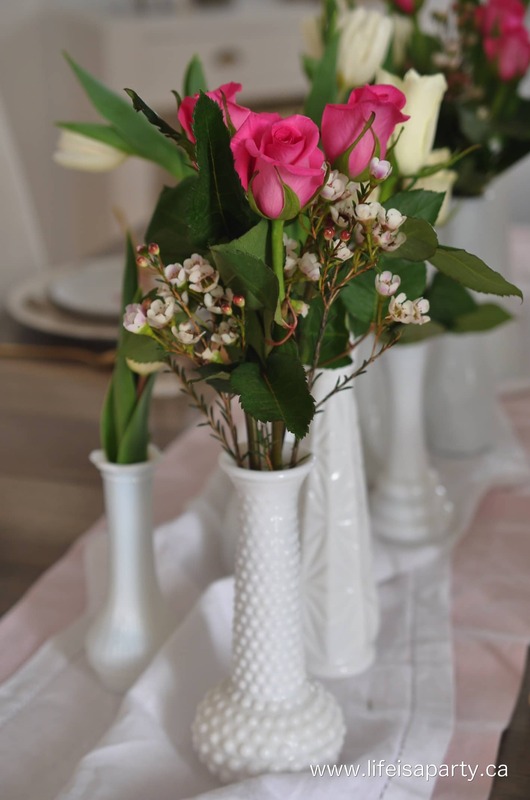 The flowers are really simple and easy to do, but have lots of impact. 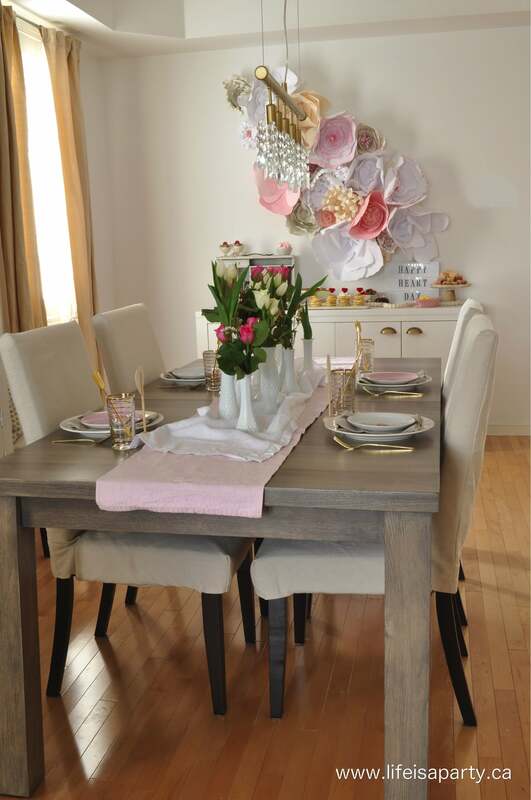 I thought the roses tied in really well with the big paper roses in the backdrop too. 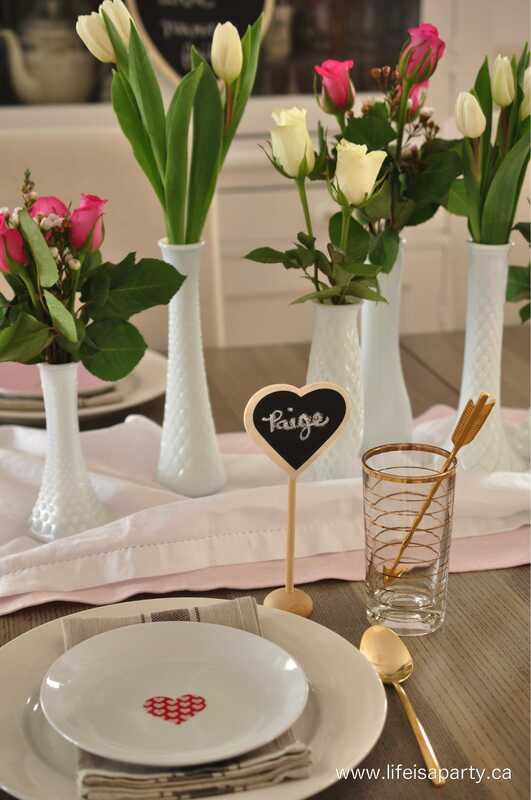 For the table settings we kept things pretty simple too. These pretty heart plates are from a garage sale years ago, and I always try to remember to pull them out this time of year. 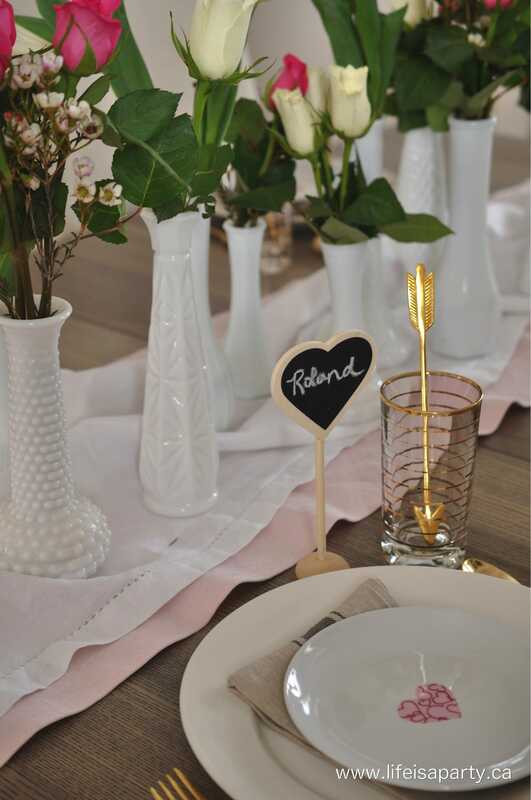 I wanted to keep things pretty neutral, in keeping with the Rustic Scandinavian feel of the room, with just enough festive pink to make it feel like Valentine’s Day. The simple wooden heart chalkboards are from the dollar store and I thought they were the perfect rustic touch. 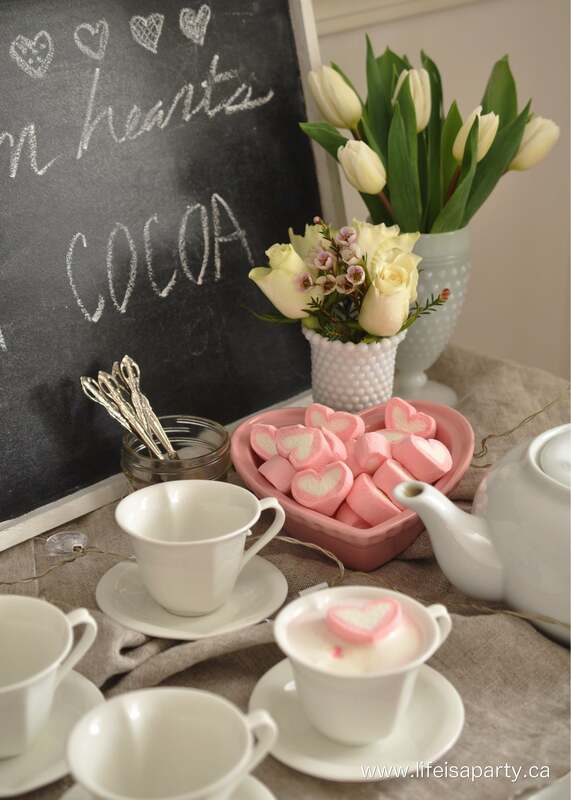 Over in the corner, one more special touch, a little pink hot chocolate stand. I picked up the sweet heart marshmallows at the Asian grocery store -they’re so perfect for Valentine’s Day. 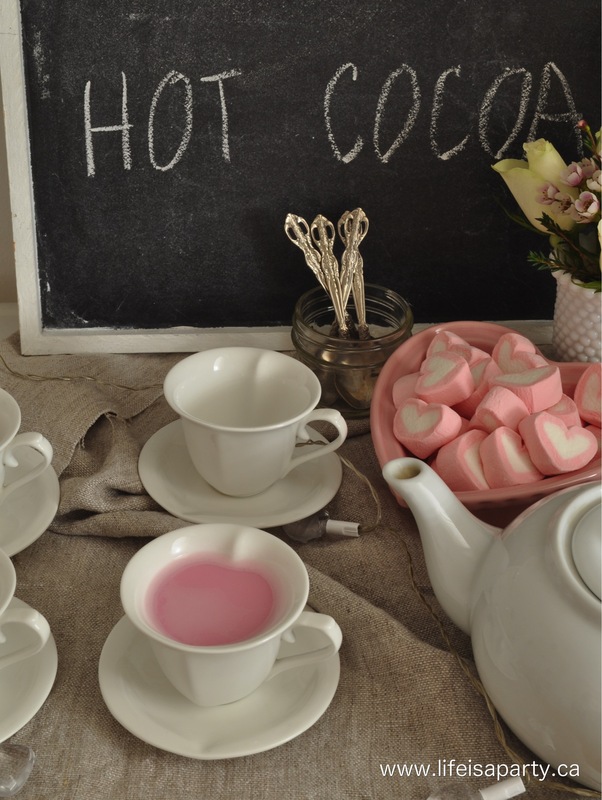 It’s easy to make pink hot chocolate, just add a little red food colouring to white hot chocolate -perfect for Valentine’s Day. 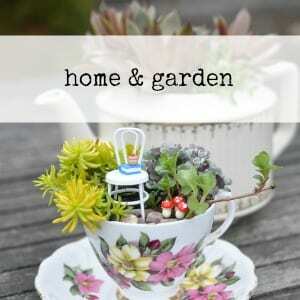 And here’s a little entertaining tip, serve it in a tea pot. 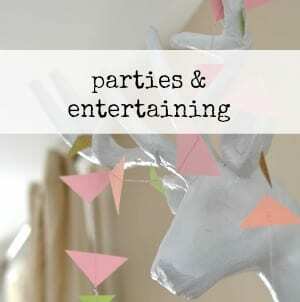 This was such a fun and sweet little family party. I hope you’re feeling inspired to do something special with your family to celebrate love day together -whether big or small, make sure to show your loved ones how much they mean to you. 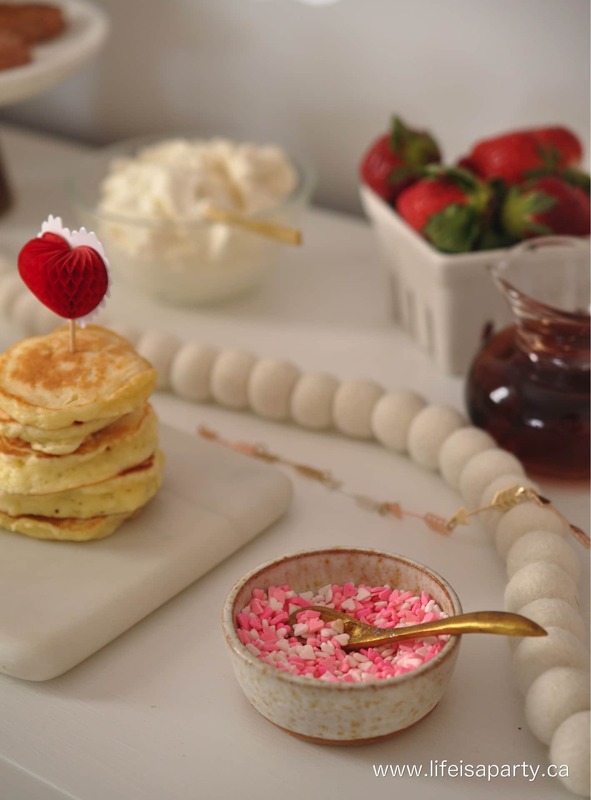 With a special Valentine’s Day Breakfast, life really is a party! 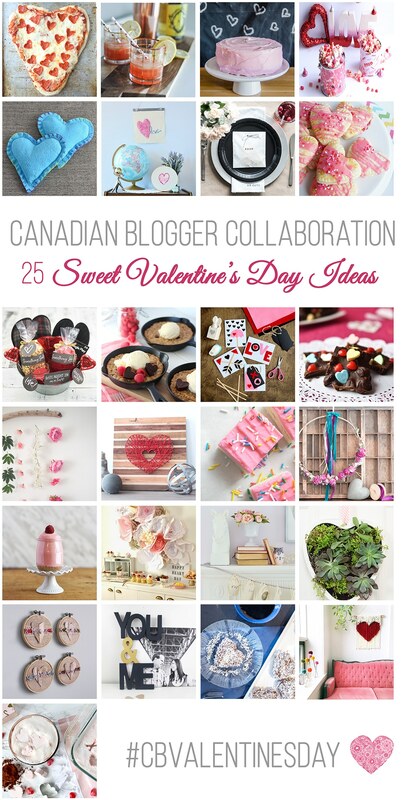 I’m joining in with 25 other Canadian Bloggers this week to inspire you this Valentine’s Day. 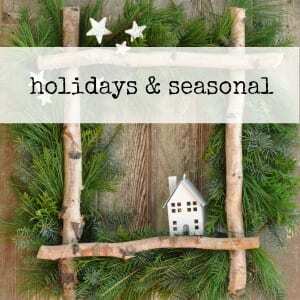 Be sure to check out their amazing projects! Can I come over? 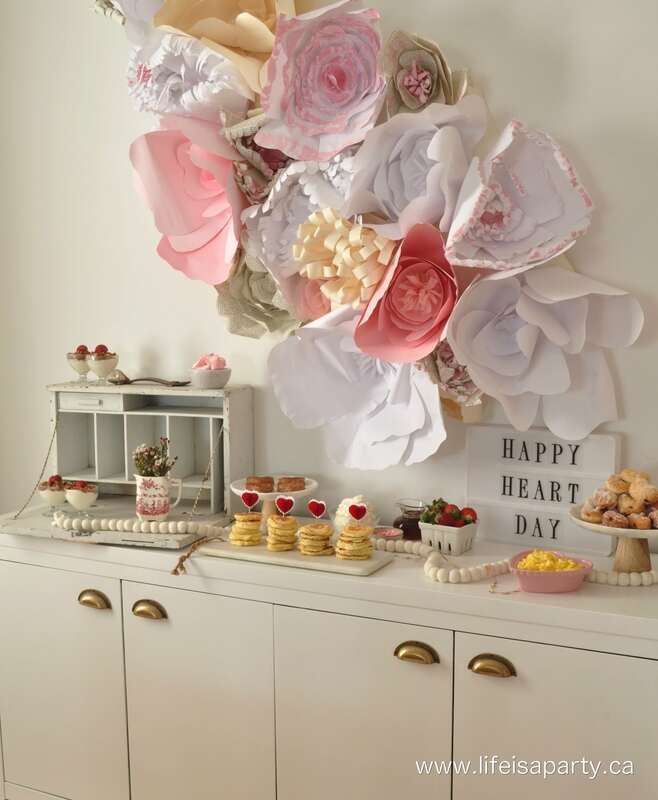 Especially love the paper flowers on the wall and the heart-shaped strawberries. 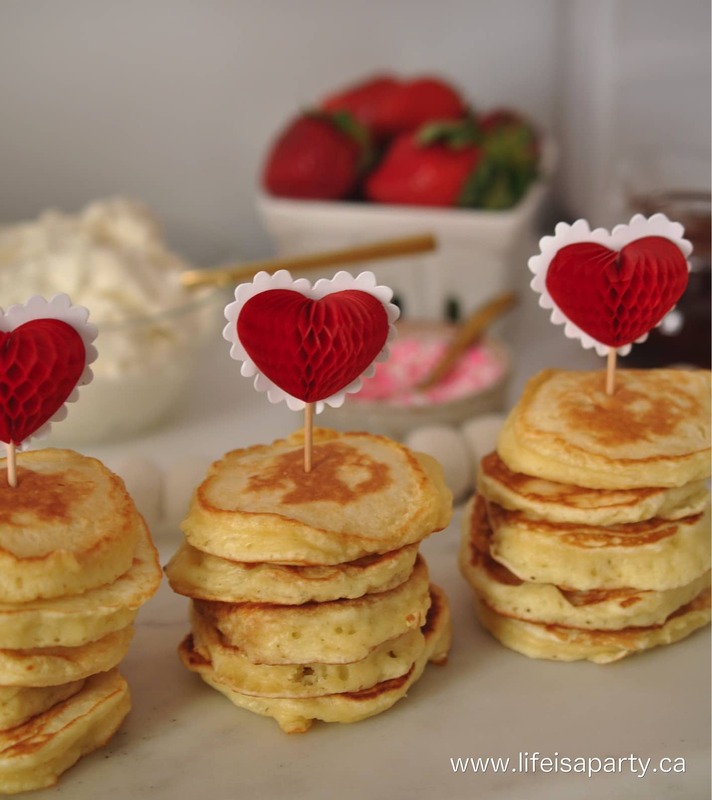 Those mini pancake stacks with the hearts are calling my name. It all looks so beautiful! I want to come to your house for Valentine’s day! LOVE the decor! 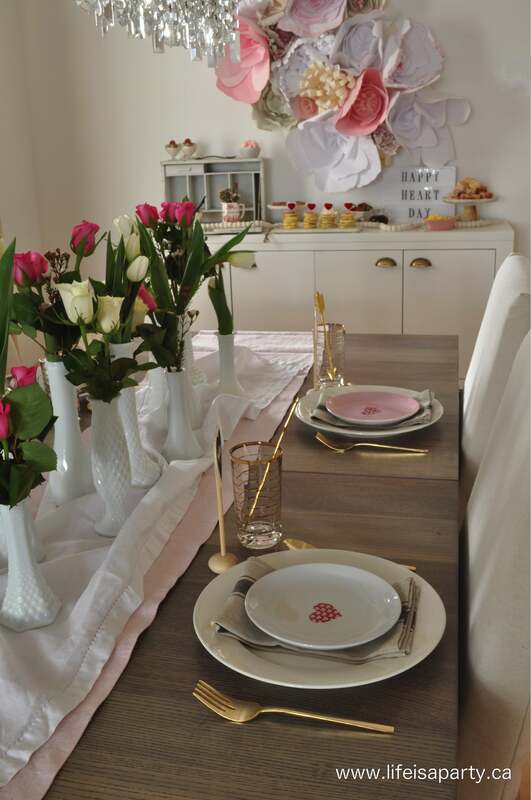 Did you put the little hearts on those plates? Or did they come like that?! What a beautiful breakfast Dannyelle! 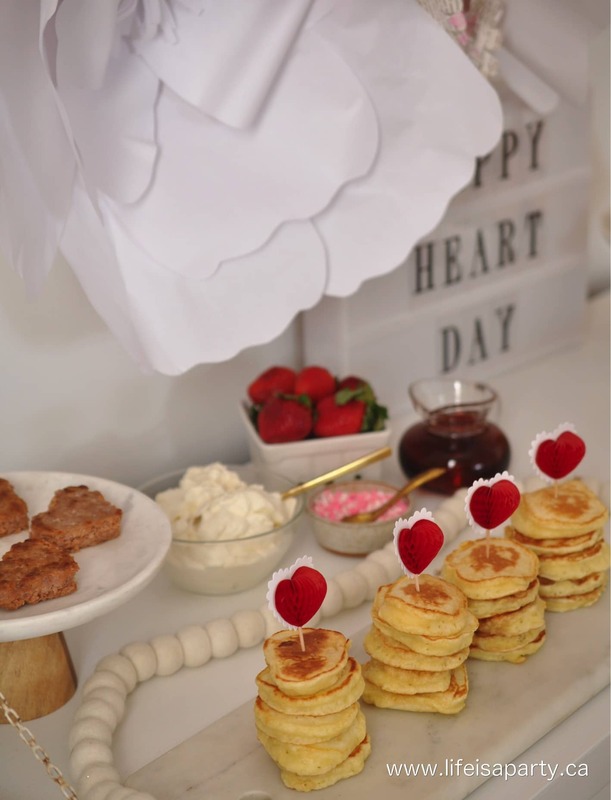 The donuts, the pancakes, the heart stix…all of it!! LOVE. But your paper flower art is my favourite…it’s truly amazing! If I had that paper flower backdrop it’d be up year-round!! Gorgeous! That is quite the Valentine’s Day setting! Very well thought out and so pretty! I adore the paper flowers and I would definitely keep them up past Valentine’s Day! What a spread of food too. 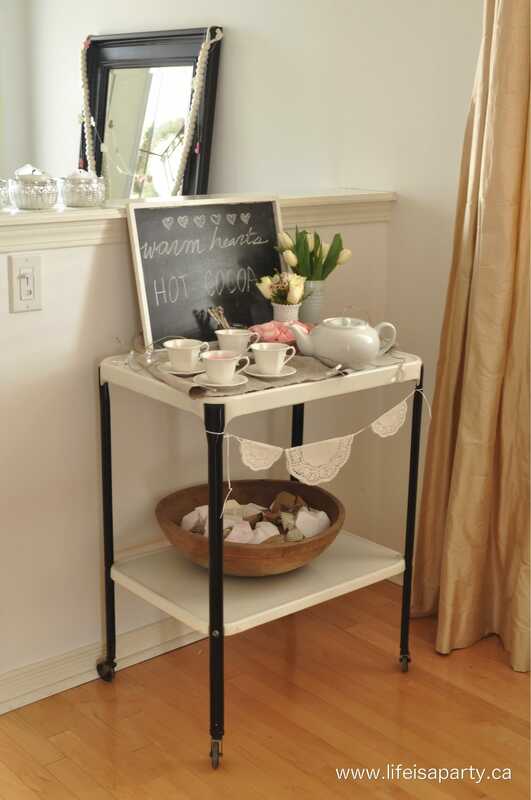 Love the idea of the buffet. I want to wake up at YOUR house on Valentine’s Day! This is all so pretty!!! Wow, when can I come over?! I’ll be there in a heart beat! The entire assortment looks amazing and delicious!